Even they say it’s unusual. In an unusual occurrence, TrimTabs February employment estimate, which uses real-time daily income tax deposits from all U.S. taxpayers to compute employment growth, was nearly equal to the Bureau of labour Statistics (BLS) estimate. 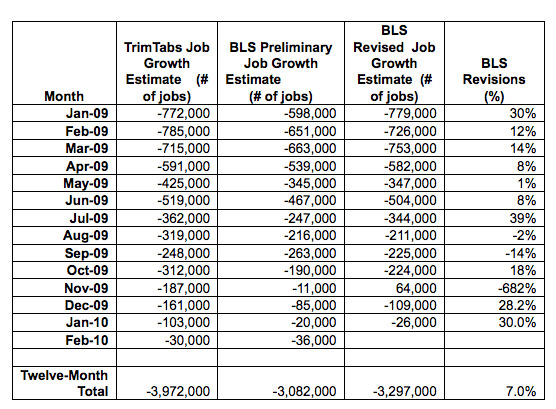 While TrimTabs estimated the U.S. economy shed 30,000 jobs in February, the BLS reported the U.S. economy lost 36,000 jobs. February’s job losses demonstrate that while the labour market is still weak, monthly job losses are steadily declining. In fact, we believe the U.S. economy will add jobs in March as the U.S. government begins to hire an estimated 1.2 million temporary census workers in the next three months. 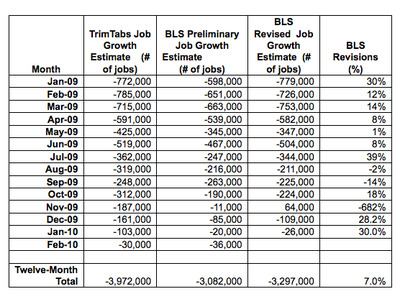 Over the past twelve months, TrimTabs results show that the economy shed 3.9 million jobs while the BLS revised estimates show that the economy shed 3.3 million jobs, a difference of 600,000. A discussion of the reasons for the difference will be presented in next week’s TrimTabs Weekly Macro Analysis.